It is possible that this knowledge about the adhesion and migration of dendritic cells could contribute to future developments in a new approach to cancer treatment. Our immune system plays an essential role in protecting us from diseases, but how does it do this exactly? Dutch biologist Suzanne van Helden discovered that before dendritic cells move to the lymph nodes they lose their sticky feet. This helps them to move much faster. Immature dendritic cells patrol the tissues in search of antigens. After exposure to such antigens they undergo a rigorous maturation process. During this maturation the dendritic cells migrate to the lymph nodes to activate T cells. Suzanne van Helden studied the adhesion and migration of both immature and mature dendritic cells. A dendritic cell can be compared with a pocket-sized general. As an immature cell he is on patrol in the bloodstream and in tissues in search of foreign bodies. The feet, or podosomes, help the cell to move around at a slow pace. As soon as immature dendritic cells detect a problem they must report back quickly to the T cells to warn them of impending danger. The dendritic cells are then hindered by their adhesive feet. This is the reason why at this point the cell undergoes modifications and loses its feet. In this way the mature dendritic cell can wing its way to the T cells at full speed. Once alerted, the T cells can intervene and tackle the problem in the body's infected tissues. Van Helden not only demonstrated that dendritic cells lose their podosomes very quickly during maturation but she also identified the substances that are responsible for their disappearance. The presence of prostaglandin E2 is indispensable for this disassembly. 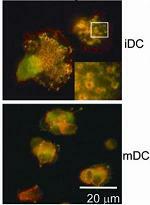 In addition, it appears that dendritic cells lose their podosomes after interaction with certain bacteria. What is striking is that only gram-negative bacteria lead to podosome loss. Gram-positive bacteria do not have this effect. Van Helden concludes that dendritic cells can apparently distinguish between different pathogens. The immune system can act in different ways to keep the body healthy. Unfortunately the working of the immune system is not perfect. In cancer for example, the immune system does not respond to the altered cells that make up the tumor. It is possible that this knowledge about the adhesion and migration of dendritic cells could contribute to future developments in a new approach to cancer treatment. Illustration: Before dendritic cells move to the lymph nodes they lose their sticky feet. –Netherlands Organization for Scientific Research.